Oh, you guys. You know that feeling when you stumble upon something so rad, so essentially, perfectly relevant, so flippin RAD-TASTIC that you actually go past the point of peeing-in-your-pants-excited and just sort of sit back and sigh and shake your head? Yeah. Like that. When most people think about food preservation, they’re focused on handling the bounty of produce that warm-weather brings. Canning berries, freezing fruits, fermenting veggies and pickling cucumbers – it’s all part of the summer flow for urban farmers and enthusiastic locavores alike. But what about people like me? What about people who are, shall we say, somewhat addicted to enamored of their greens? People who can’t go a few hours without wolfing down some kale or rolling up some collards or blending a bunch of spinach ? For us, summer means the end of greens season (they thrive in the cool climate of late spring and early fall), and 3(ish) months of life without local organic green goodness. Summer is a sad time for my blender . . .
Ginormous organic chard for $1/bunch (!!!). I couldn’t turn it down, but how could I use it all up before it went bad? And so began my scheming. This concept is so simple that I simply can’t believe it hasn’t occurred to me sooner. And I really can’t believe I haven’t seen it elsewhere in the blogosphere! But there you go. 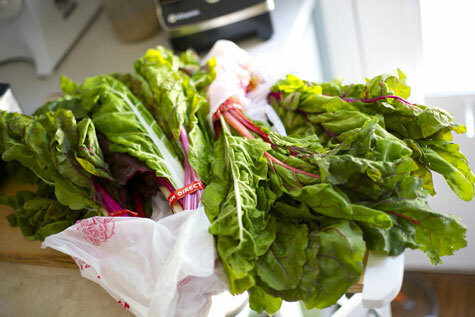 Procure a large quantity of fresh, local, organic greens (like spinach, collards, chard, dandelion, etc). And I do mean large. 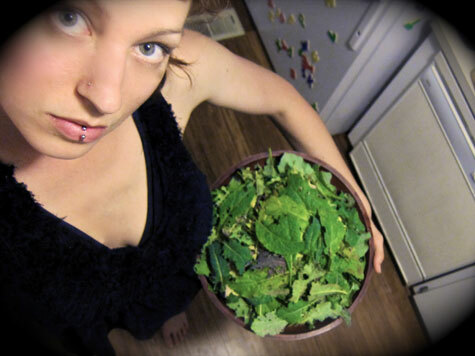 In the picture above, I’m holding the entire yield of kale from this year’s garden. That’s about 1/5 of the total greens I used. Wash and de-rib the leaves. Lay them out flat on dehydrator trays (for a raw powder) or baking sheets (for oven, non raw). 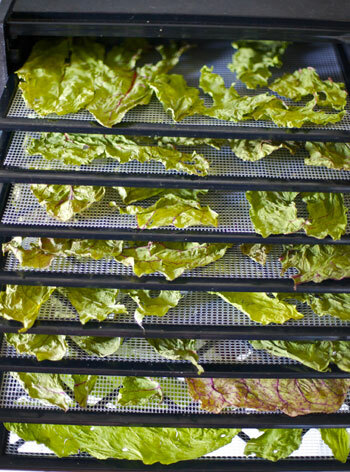 Set your dehydrator at 115º and allow to run overnight, or until leaves are completely dried (up to 12 hours). Alternately, you can set your oven at the lowest temperature and use that, but I haven’t tested this method so you’ll have to keep an eye on the timing. Just remember, you’re aiming to pull the moisture out – not to actually cook them. So keep the setting low! Next, you’ll need to grind your greens into powder. 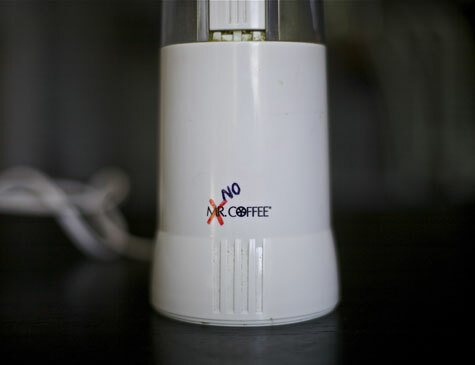 I like to use an electric coffee grinder which I reserve for things like flax, dried coconut, and other caffeine-free culinary specimens. 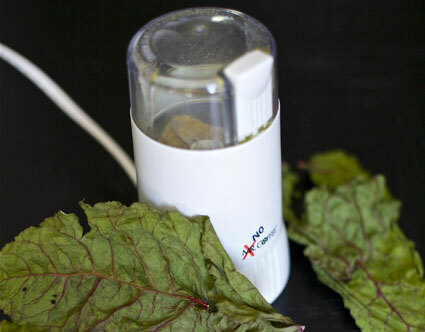 You could also use a spice grinder, a mortar and pestle, or a food processor. But this is a LOT of product to work through, and you want to get as fine a powder as possible, so a coffee grinder really fits the bill. Grind grind grind in batches, until voila! You’ve saved a few months worth of greens. I had to repeat this entire process four times, and it still barely yielded a couple cups of powder (and I have a 9-tray dehydrator!). But that means this is incredibly concentrated green nutrition. 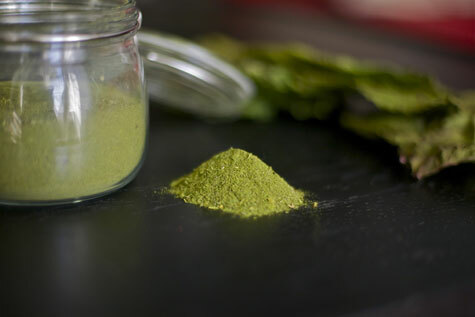 Use it as you’d use any other green powder – for me that means a lot of smoothies. A little bit goes a long way! This will make a great project for late autumn, when the second crop begins to die back, and once again we need to preserve a stock of fresh local organic greens to make it through the off season. Well that is just awesome and an idea that had never crossed my mind (I am obviously way too conventional). Thanks so much for the tip. How much do you use per smoothie? Love this idea! I’m trying it right now!!!! Awesome recipe. My boyfriend eats almost no vegetables at all. I bet I could sneak this powder into spaghetti sauce and maybe into hamburger. Got any other way I could sneak him some nutrition? I am so very glad that this idea was posted. I just found this blog, and I will be back…lots and lots!!! You’ve encouraged me to do what I have wanted to do for awhile, and you took it all the way downtown!! I have some yummy kale chips and wanted to “powder” them up to use for a seasoning…..and that’s what’s next on my agenda today. Thanks for the inspiration!!! This is a GREAT blog…and I don’t say that lightly!!! Thanks, Sayward!!!!! This is amazing. I can’t believe I never thought of this. Thank you! Just tried this last night with collards, turnip greens, mustard greens and spinach – it’s a labor of love, but it’s wonderful! Thanks, S. Start posting again, thx. P to the S – I use a Nesco American Harvest dehydrator with 4 trays – I did 4 full trays on 115 for about 4-5 hours and they were perfectly dry! This is really brilliant! I can’t believe I never thought to try it! Hi, I am very new to the green game. I tried pumpkin leaves today, all of this blows me away as to what I have in my garden for greens. My question is if I dehydrate a lot of different greens can I mix them all in one jar so there is a large variety. From what I have been reading you need to constantly keep your greens changed. Thanks for your post and help! You can definitely mix them all together, that’s what I do and it makes for a much more nutrient-rich powder. Luck! 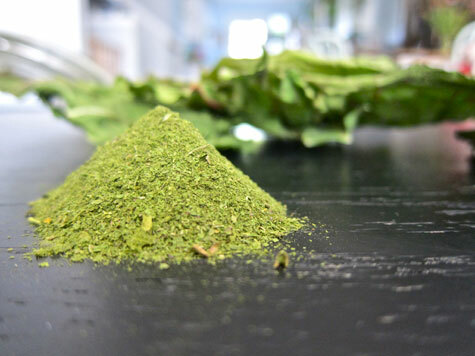 Do you think you could do this for other dehydrated fruit as well, such as strawberries or bananas and then grind it up to powder as well? About a tablespoon, I’d say. Absolutely! You just have to get it completely dry. If you can do that, it would work with anything. ust found you… and very glad! 1$ a bunch for the chards? Lucky one… here, where I live, they are almost 3$ a bunch of 4 leaves :( So, going green is expensive. I had to stop for a while but i will go back to completly raw next week (pension day).. my health needs it… even though all my little nano-budget will go toward food. Oh! And I do the same with the tomatoes… it is delicious! Such a Great Idea..can’t wait to do this! How is the taste, though? I’ve never had green powder and usually don’t put greens in my smoothies, as I eat enough vegetables. Does it affect the taste? Like most green powders, it tastes a little grassy. In a smoothie with sweet fruit, I wouldn’t really notice it. If you tried to do it in a plain banana smoothie or a vanilla smoothie or something, you’d definitely taste it. But because it’s so concentrated, you really don’t have to use very much. Really amazing and healthy recipe..I’ll also try to make it. I haven’t tried it myself but I have had dandelion powder. It’s totally doable! Tastes very strong so you only use a little at a time. Dandelions are sooo nutritious though! Could you do this with other greens like lettuce? We’re getting TONS of various greens in the next few weeks through our CSA – green & red romaine, buttercrunch, sorrel, dandelion greens, etc. So, I’ve been reading your blog since long before you posted this, but didn’t have a dehydrator. Then my mother-in-law got me one for Christmas last year, but it was a bit neglected until recently. When you mentioned this post in a more recent entry, I was hooked! I’m working at an organic farm this summer, and there are always greens that go a little limp by the end of the day at the farmstand that we can’t sell, too much to eat. I made my first batch today with beet greens and chard – this will be perfect to stash away for hubby, me, and my now-10-month-old boy come winter! How do you store your kale powder? Does it have to be refrigerated? Nope it’s just in airtight glass! you can also use the green powder and put them in capsules and take it like an herbal supplement instead of making smoothies. Don’t forget you can use your oven too to dehydrate. Wonder if you could add in some purple basil and green basil leaves ? Maybe just a few sprigs of mint oregano thyme? Give it some umph !